Affordable Ashworth luxury Oceanfront condo in NMB, Owner rented, avoid fees. 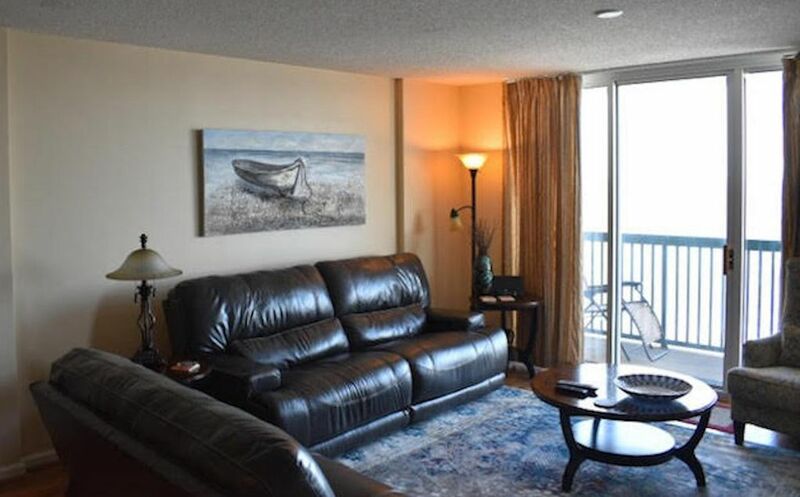 Bring the family and enjoy this beautifully decorated beachfront condo. Three bedrooms and three baths make this a roomy and comfortable getaway for everyone. Enjoy gorgeous sunrises and sunsets from the large balcony. Spend the day on the wide sandy beach of North Myrtle. An easy one-block walk to beach shops, restaurants, ice cream, and specialty shops galore. A classic beach front pavilion is on the corner with a fully equipped arcade the kids will love. Ten minutes from excellent shopping at Barefoot Landing. The perfect rental for a great vacation. **MONTHLY RENTALS AVAILABLE , CALL FOR RATES, NOT THRU A COMPANY. Nice indoor and outdoor pool. Large, recently renovated hot tub. Lazy river, kiddie pool, charcoal grills on grassy play area. Everything was awesome! The unit is beautiful with a million dollar view! We booked at the last minute and the owner was great to work with. Can't wait to go back! My family just returned from a week spend at this condo. We could not have been more pleased. Beautiful view, comfortable beds, great AC, view of ocean from master bed, and great amenities. Larger than usual private balcony with beachfront view, single level layout with a private bathroom for each bedroom, good kitchen layout with dishwasher (no granite counter tops or stainless appliances but very clean and functional), roomy bedrooms and comfortable beds, and very comfortable living room with comfortable leather couches, and the list goes on. The room is more than adequate but the thing I was most impressed with was the facility itself. The Ashworth is an 18 floor complex with two pools, lazy river, huge hot tub, and grassed outdoor area for grilling and outdoor dining. There are four elevators and they are super fast. We never had to wait more than a few seconds for an elevator. And you will not find a cleaner facility anywhere. The pool and sun area were hosed down each morning and the entire area was almost spotless. I highly recommend this rental property. Owner was great to work with and even called during the week to check in and see if we had any issues. And the cleaning lady had the place spotless and even texted me to let me know the room was ready. This was a great experience for our family. I have always said that no review is valuable unless you get both good and bad so here a couple of minor negatives which would in no way keep me from renting here again. I would have loved a ceiling fan in the master bedroom, did not find the DVD library until the last day, and the clothes dryer was slow to dry. Otherwise this place is an A+. Oh, and one more complaint......I didn't think those kids in the pool were ever going to find Marco.....Polo! (only one day, the rest of the week was very peaceful) Thanks again to the Rizzo family. We have been staying here the same week every year, for the past 6 years. We will NOT even consider another place. A truly wonderful place and experience. This was our 2nd time staying here and we enjoyed our stay even more. The upgrades to the unit were a pleasant suprise when we first opened the door. The owners are easy to deal with and make the whole experience a pleasant one. We hope to vacation here again. Great..Great Great... is the only thing I can say about this Condo. Our visit on January 13, was one of the best that we have had since I have been going to the beach in 10 years. After arriving at the condo the owner Jim took the time out of his schedule to call us to make sure that the condo was what we had expected... It was more.. the only way to describe it was BEAUTIFUL. The deco, kitchen and the new beautiful flooring that was recently put in was of great taste. The condo was so well maintained and very clean. If you are ever in need of a place at the beach to stay I would highly recommend this condo to rent. You will not be disappointed and the best thing about renting this is that you do not have an agent to go thru the owner takes care of everything themself. Which was GREAT. Thanks Jim and your family for allowing us to use your home for our visit.. you will be the first that we check on when we return to NMB for sure. you will be highly recommended to all.